enter UCS IP address and UIM/P will do the rest. 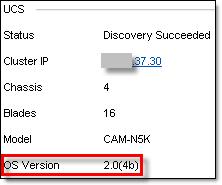 See full output on the “Install and configure EMC UIM/P” blog post, step 8.4.2. UPDATE courtesy of Ziggy: Sometimes it might be necessary to delete *.0 files as well. 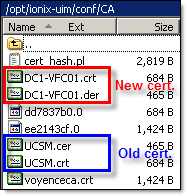 7 comments to EMC Ionix UIM/P: UCS Discovery Failed. Replace expired UCS certificate. Hi Mark, sometimes it might be necessary to delete *.0 as well. Thank you for your comment. I will update the post. Hi, Do you know how to stop Master Device Service (only)? You might have zombie services. I did as per you suggested. The only process running after stopping wrapper service were root (ssh). Any other suggestion?